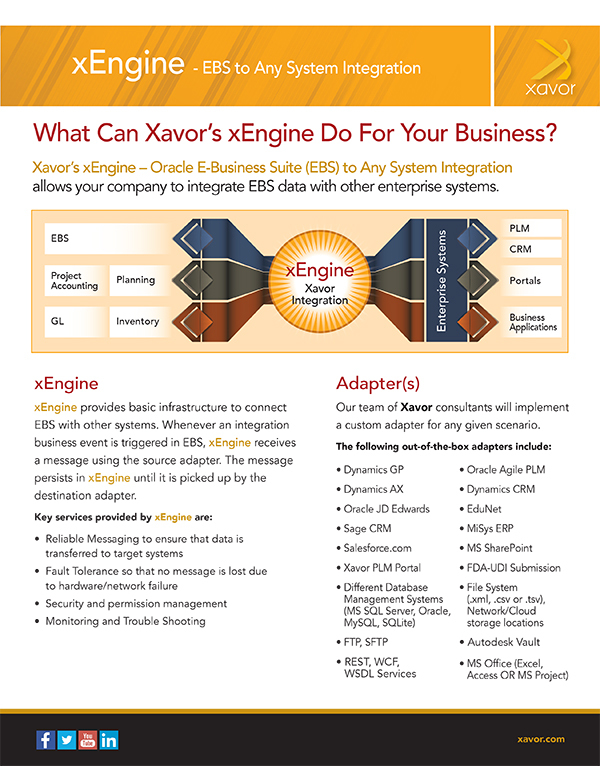 Xavor’s xEngine – Oracle E-Business Suite (EBS) to Any System Integration allows your company to integrate EBS data with other enterprise systems. xEngine provides basic infrastructure to connect Agile with other systems. Whenever an ECO/MCO is approved in Agile, xEngine receives a message using the source adapter. The message persists in xEngine until it is picked up by destination adapter. xEngine provides out-of-the- box adapters to connect Agile with ERP’s such as EBS, SAP, QAD or any other system. Our team of Xavor consultants will implement a custom adapter for any given scenario.